Add new enjoyment to your home with the valuable and attractive update that comes with new flooring. Our flooring store sells all types of ceramic tile flooring to home and business owners looking for a transformative upgrade that will last for years to come. Throughout the years, tile floors made of ceramic have been one of the bestselling materials on the market. Not only does new tile upgrade the appearance of your home, it also adds to its value. No matter your reasoning behind the purchase, visit our flooring store for the most affordably priced ceramic tile in the area. Why Choose Ceramic Tile Flooring Over Other Materials? Ceramic floor tiles have stood the test of time with many consumers—both homeowners and business customers. Our customers are drawn to ceramic tile because it is beautiful, varied in appearance, and durable. You’d be surprised at how many colors and styles of ceramic floor tiles are on the market. Have you ever walked into a nice restaurant, friend’s home, or high-end building only to stop and notice the flooring in place? Instead of feeling like your home does not reflect your style, invest in new ceramic floor tiles to complement your home’s décor and your favorite pieces of furniture. Our flooring professionals are pleased to help you navigate our showroom to find the right choice for your individual space. Whether you want to change up your kitchen or re-floor your entire home, check out our affordable prices to find a look to match your needs. We have ceramic tile in styles that look Mediterranean, as well as those that natural stone. Many business owners feel like they have to settle on generic flooring for their spaces because that is the safest aesthetic style to choose. Break the cycle of drab flooring and patterns that are hard to look at by purchasing classic ceramic tile. 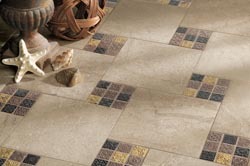 We are happy to help you find the right tile for your office entry, kitchen and break rooms, or even the entire space. Minor details like trim and patterns add even more style to this beautiful flooring. With employees constantly going in and out of the office, invest in flooring that stands up to water, dirt, dust, and more. Contact us today to learn more about our current sales on ceramic tile flooring or brands we currently have in stock. We are proud to serve clients in the communities of Longmont, Niwot, Frederick, Firestone, Louisville, CO, and the surrounding areas.